Get reliable Microsoft azure services and IT service management at Wintellisys that will enable you to establish an efficient, stable and a highly scalable IT organization. What are the benefits of using an Altaro VMware backup solution? With the aid of backup VMware, a user could avail of centralized VM backups a user could avail of a centralized backup facility which boasts of managing backup from the server or the host providing services to all the clients which are connected to the network. Have you lost your data and cannot recover it because you don't have a backup? Try Altaro VM backup services. A VM backup service is a storage service where documents, files or even the entire folders on a hard drive are stored in a remote server or computer away from your physical location of operation. It is an offsite data storage service that allows you to perform data backup and get access to the same data through an internet connection. The main aim of using Altaro Backup services is to ensure data is not in a case of unexpected eventualities. The clients can also access the data anytime so long as one’s computer is connected to the internet and one is authorized to access the data. Enrolling for Altaro Backup services is a breeze. Most Altaro backup service providers will require you to have a computer connected to high-speed internet. They will also expect you to pay a small fee that will allow you to use their services depending on the duration you decide to employ their services and the amount of storage space that you want to be allocated. Wintellisys is one among them. We will supply you with the web interface that allows you to access the remote files and folders. The web interface makes the files appear as if they are stored on your local hard drive. Various factors like downtime could be reduced or decreased with the use of backup VMware. The trustworthiness of this backup service is increasing day-by-day. Every disaster management technique is taken care of with the help of backup VMware. The performance of the system is also improved. There are different methods incorporated in order to protect data as well as to minimize the loss. Different types of loss could be incurred due to unprecedented effects causing the server or systems to stop working properly. 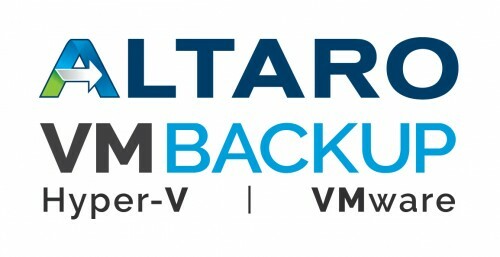 Altaro Backup provides a user-friendly and full-featured and VM backup solution for VMware and Hyper-V, offering you all you need at an unbeatable value, backed by outstanding support. With the help of this amazing backup service, you can manage a large number of hosts and VMs. Altaro VM Backup consolidates backup programs such functions as integrating with present backup technologies, perform a full or partial file backup of virtual machines, and handle backups in a central location. VMware supplier provides 24*7 monitoring of hardware, firewalls, web connection, and power. It ensures that your data is secure from malicious bugs and unauthorized entry. VMware is a proven method of maintaining the highest data security making it an effective and valuable web hosting solution for all size enterprises.